LINCOLNSHIRE, IL--(Marketwired - May 31, 2016) - Bentley's Pet Stuff, a family-owned, multi-unit healthy pet foods retailer founded by Lisa and Giovanni Senafe, along with entrepreneur Marcus Lemonis, host of CNBC's reality series, The Profit, are pleased to announce the opening of a new store in Crystal Lake, Illinois, located at 5300 Northwest Highway. 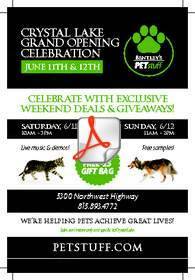 To celebrate, Bentley's Pet Stuff is hosting a grand opening event to be held on Saturday, June 11 from 10am to 3pm and on Sunday, June 12 from 11am to 2pm. The grand opening event will offer customers exclusive weekend deals and giveaways. The local community, business owners and pet parents are encouraged to attend and to bring their leashed four-legged friends to join in the fun! The first 50 shoppers to visit during the grand opening celebration will receive a special gift bag (valued up to $25) and all shoppers will receive free samples and enjoy live music and product demostrations. * The store's adoption partners, Helping Paws and Animal Outreach Society will be onsite Saturday, June 11 from 10am to 2pm with cats and dogs available for adoption in honor of June being the official National Pet Adoption Month. 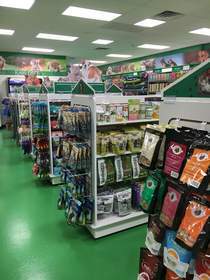 Bentley's Pet Stuff sells natural food, pet care essentials, toys, grooming products and treats for their four-legged friends. The company focuses on the three critical elements in caring for pets: to nourish, energize and reward. Specialty pet food brands such as Fromm, Orijen, Zignature, Honest Kitchen and Stella & Chewy's can be obtained from all Bentley's Pet Stuff locations. In addition, seasonal products and holiday gift items are available for purchase throughout the year. The retailer has been a fixture in the Chicago market since 2008, and currently operates 19 stores in the Chicagoland area, with several locations under renovations in the Milwaukee, Minneapolis, St. Louis and Denver markets after recent acquisitions. "We're constantly researching new areas and opening up new stores to provide pets and their owners with a one-stop location for a variety of competitively priced, quality natural products," said Lemonis. "We are excited to host the grand opening in the community of Crystal Lake and look forward to more openings and acquisitions throughout the year." For more information about Bentley's Pet Stuff stores, products and history, please visit www.PetStuff.com. For information on future store opening plans, please contact Giovanni Senafe at 708-214-4197 or giovanni@bentleyspetstuff.com. Marcus Lemonis is an entrepreneur, investor, television personality, and chairman and CEO of Marcus Lemonis LLC as well as Camping World and Good Sam Enterprises. Camping World is the nation's largest RV and outdoor retailer, and Good Sam is the world's largest RV owner's organization. Visit www.campingworld.com for more information. Lemonis is known as the "business turnaround king" and host of CNBC's prime time reality series, The Profit, in which he lends his expertise to struggling small businesses around the country and judges businesses based on a "Three P" principle: People, Process, and Product. The Profit returns on Tuesday, August 23rd at 10pm ET/PT on CNBC.